Woolwich Web Works is the freelance business of Liam and Megan McDermott. We are centrally located in the small town of Elmira, Ontario (near Kitchener/Waterloo), Canada and work for clients in Canada, the US, UK, and wherever you are. Using readily available software building blocks, made by a community of developers; this includes Free and Open Source software (like Drupal, Facebook’s React, Google’s Angular, Haskell and GNU/Linux). There is an optimal size for software teams that tends toward smallness, and simply adding more people to a project does not speed it up. Using Free software enables us to be bigger than a two-person team. 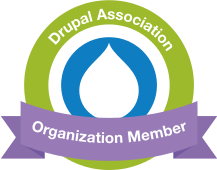 Drupal does all the routine parts of building a website for us. This makes it possible for a small team to build big projects at minimal cost. Even as we expand, we value the advantages of a flat management structure. Lean economic times mean your suppliers should be lean too, we will ensure budgets will be spent on the real work required to complete projects and not on overheads. Between us, we have almost 40 years experience in web design and development. Our skills are complementary, and cover a broad range of web design and development requirements. If we don't have the expertise ourselves, we can surely connect you with someone who does. Through all of these years working in web development we learned many lessons from both successful and unsuccessful projects. An agile, collaborative process. Your team is involved at each stage of the process, helping to improve results and reduce costs. Usability matters. Both for visitors to the site, and your content producers, we want to make sure your site is easy to use. Continuous evaluation: what's working, what's not? Using Analytics, user feedback, and other methods to ensure site is working well for users and meeting its goals. We provide ongoing support and maintenance, with progressive improvements to your site. Liam and Megan McDermott met on a web development forum in the mid-2000's. Since then, we have been working together to develop website solutions. Liam McDermott specializes in backend web development using PHP, Haskell, Node.js, or whichever language suits the project. He is also skilled at what is known as "Dev-ops": configuring server infrastructure, managing code repositories, and deploying code changes through development, staging, and production environments. All of this means that we can make ongoing changes and improvements to your project without disruptions. Megan McDermott is an expert in front-end web development (HTML & CSS), Drupal site building, and user experience design. She is particularly interested in merging the needs of website visitors with your business goals. At Woolwich Web Works, we don't just build big web projects. We also continue to support you and your website as long as you need us. We are happy to continue to work with you to add new functionality, fix bugs, and keep your website looking fresh. As part of all or our projects, we build in methods for developing changes in a local environment and deploying them to your production site with minimal disruption. This makes it easy to continue to evolve and improve your site. Is your in-house team overwhelemed? Or perhaps you're missing some expertise in key areas. Woolwich Web Works can help. We have many years of experience collaborating with in-house development teams on an ongoing or project basis. We are comfortable working with a variety of project management tools and development workflows.